The three nuns, Sisters Peter Joseph, Maria, and Evangeline, are Dominican Sisters of Mary, Mother of the Eucharist. Their community was founded only in 1997 in Michigan. Now the group has more than 120 sisters, many of whom are in their 20s. The team has already won two preliminary rounds. The final show airs Thursday at 9 p.m. ET/8 p.m. CT. The grand prize is $100,000. 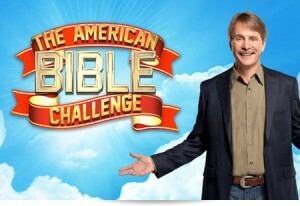 The winner of the American Bible Challenge Fan Favorite contest will be announced during the show, as well. The prize for being voted the “fan favorite” is an additional $10,000 for the team’s charity. Should they win, the Dominican Sisters will use their prize to provide for the treatment and care of the aging sisters in the order, and to ensure that they are provided for as they advance into retirement. 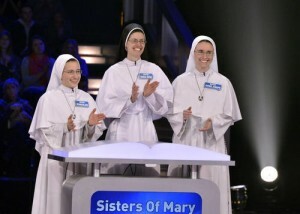 Sister Peter Joseph spoke with ZENIT last month about the experience of evangelizing through a game show. Previous post: Why This Voyage to Follow St. Paul, St. John and Mary?